BOSTON, August 23, 2010 – Technomad LLC, a leader in high-powered weatherproof PA systems and communications equipment for military, security and other government applications, announces the shipment of $310,847 in public address equipment to improve audio communications at U.S. military bases both stateside and overseas. Technomad Military PA systems are used around the world for military/Giant Voice applications including mass notification, force protection, combat simulation and training, large range firing systems, PSYOPS, operations scheduling and tactical/mobile PA. Recent shipments include military bases in the United States, Europe, the Middle East and Central America (Honduras). Overseas deliveries include Turnkey Military PA Systems to forward-operating bases in Afghanistan and Iraq featuring weatherproof, self-casing loudspeakers and SuperConductor military mp3 player/recorders. The SuperConductor delivers operations scheduling to military bases with a hassle-free way to upload audio files for immediate playback from a front panel knob position, or reliably schedule sounds for automated playback based on an internal time clock. Technomad is also shipping a FireFly tactical PA system and a SuperConductor to a military base in Germany. The Technomad FireFly is the first portable, weatherproof, self-casing, all-in-one tactical and mobile PA system for the military. Applications include Special Forces and PSYOPS missions where the FireFly’s loud, clear audio output and long battery life allow troops and military personnel to broadcast voice and audio on the move. A second U.S. military base in Germany is expanding its base-wide Technomad Modular PA Systems with a remote Audio Source Pack and an Ethernet Link Kit to expand long-range communications. The Technomad Audio Source Pack is a complete pre-wired rack with all the necessary signal processing and audio playback components for delivering audio in Technomad Modular PA Systems. The Ethernet Link Kit takes advantage of an existing network connection to stream audio to remote “output packs” at various loudspeaker points, providing excellent audio quality and zone control. Technomad is delivering new Turnkey PA systems and expansion kits for existing systems to military bases in United States, including six weatherproof loudspeakers to expand a firing range system on a base in North Carolina. The largest recent domestic project includes a nearly $100,000 system for a weapons and field training battalion in South Carolina. The shipment includes two Turnkey PA Systems with expansion kits including multiple additional loudspeakers and wireless microphone systems. The same base has also ordered two FireFly systems for tactical and mobile PA. In addition to “in-theater” applications and use as a general PA system, Technomad Military PA Systems are often used for common ceremonies include parades and change-in-commands. The SuperConductor is often integrated into Military PA System applications to simplify and enhance audio playback, add field recording capabilities and introduce message repeating for training drills, emergency situations and general base information. 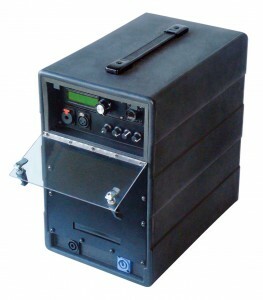 All Technomad Military PA Systems (turnkey and modular) include weatherproof loudspeakers with broad dispersion (180-to-360 degrees for up to one mile) plus a high-powered amplifier, six-channel mixer, and CD/tape player to power voice and music over long distances — all pre-wired into a shock-proof signal processing rack. Loudspeaker stands, a dynamic switched microphone, cables and connectors round out the turnkey systems. Options include the SuperConductor, wireless microphones and land-mobile radio (LMR) interface units for communication with guards and soldiers on foot. Technomad LLC, founded in 1995, designs and manufactures loudspeaker systems for the professional audio and security/military technology industries. The company invented the first reliable full-range military PA systems and now offers eight models with range up to one mile, as well as the SuperConductor military MP3 player and FireFly ultra-lightweight PA system.